Charity Debate: What makes a Charity a Charity? Charities are created to help those in need, right? Two articles have recently appeared questioning the right of some charities to be allowed to have charity status. Both articles are on right-leaning sites, and they make slightly different but similarly critical points. The Charity Commission in the UK is the body which regulates the activities of charities. It is likely that many of the charities Phibbs has in mind are likely to oppose policies associated with a right wing government, as we have in the UK. If charities were largely anti-left then one wonders if he would have the same problem. But does he have a point? Is it right that an organisation campaigning against poverty (rather than actually caring for the poor) should be any different from a political party? Or is it that such a charity’s expression of caring for the poor comes about by campaigning against welfare cuts? There is no doubt that it should be possible to distinguish between a political party and a charity but there does appear to be a spectrum of activities which need to be divided into one camp or the other. A different angle on the (mis)use of charity status comes from Tim Worstall of the Adam Smith Institute. Worstall examines one charity in particular, called WRAP. This charity produced a report for the government on the use of plastic bags. But what was of particular concern to Worstall was that 98.9% of its funding came from governmental or EU sources. Is he right? Well, yes, in a sense. Although there is more to this particular charity than counting plastic bags. What is interesting though is that the governments themselves had to create, or at least sustain, this charity to do its work rather than make its activities part of a government department. “The IEA is an educational research charity. We do not accept or seek government funding and we’re reliant on donations from individuals, companies and charitable trusts to carry out our mission. So the ASI has managed to avoid criticising the IEA, because in its article the main gripe was about government funding. However Phibbs’ article on ConservativeHome suggests that the IEA should perhaps not exist as a charity. Their claim about being “Educational Research” does sound rather tenuous! 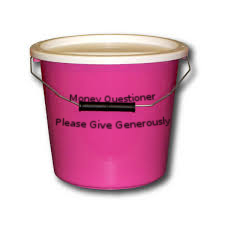 A criticism often aimed at charities is the extent to which they spend money on “overheads”. Clearly overheads are unavoidable, but when executives have salaries which match those found in boardrooms of large companies, benefactors start to get twitchy. In the USA, Forbes reported that nine of the 50 largest charities paid one or more employees over $1 million. The UK isn’t immune from the same criticism either. According to The Telegraph last year “A survey of boardroom pay among the top 150 charities found that 32 executives were paid over £200,000 last year, up from 30 in 2013.” However looking at the charities highlighted by The Telegraph suggests that these high payers are healthcare charities. This raises another question. Are healthcare charities really charities or private health businesses? Put differently, do these charities dispense their services to those who most need it or do they exist to support private hospitals and healthcare? In Australia, some of the largest charities are universities. Although universities don’t qualify as charities in the UK and the USA (as far as I am aware) there is no weaker case for these than there is for the aforementioned healthcare charities. What charities to people give to? The largest charity by far in the USA is United Way. This charity had revenues of $4.3 billion in 2014, mostly from private payroll donations, massive by any standard. However it has 1300 local affiliates so arguably it shouldn’t be considered as one single large charity. Forbes lists the other largest charities, and famous names like the Salvation Army and the Red Cross are represented among other names helping the poor and providing foreign aid. The largest charity in Canada is also a foreign aid charity. Medical and poverty charities make up most of the top 10 Canadian charities. In Australia, foreign aid tops the list of largest Australian charities. Besides the universities, we see a similar profile of activities to those found in the USA and Canada. It looks like it’s safe to conclude that many large charities are there to fight poverty, to provide medical help and research, and provide foreign aid. Some do all three. The Adam Smith Institute and ConservativeHome like to think they influence Conservative government policy. Although the UK government has said nothing on the matter, it’s unlikely to be the end of the debate, especially with the government wanting to collect more tax revenue. This site will follow the debate as or if it unfolds.